It’s a common refrain you’ll hear over and over in the coming days as the town tries to digest the news that our favorite sons have decided to retire. And it’s true for a lot of us. I know it’s true for me. I can’t claim to have been there from the beginning. Born the year of Document, my first intro to the band involved Sesame Street and a song called “Furry Happy Monsters.” I was maybe 10 when Bill Berry retired. My older friends, ones who were actually there at the old church that famous night, are fond of telling me how much I missed. So yes, I’m part of the younger generation of R.E.M. fans. The only memories I have of the early days are of long faded photographs and bootlegs from shows played in places that don’t exist anymore. Thanks to Youtube, I can watch the blonde Stipe shake and shiver, see Bill in full on flight, watch the roar of Buck’s guitar and laugh at Mills’ nudie suit. But I’ve got my own experiences to draw on now, looking back on the amazing career that the guys have had. This blog you’re reading? It wouldn’t be here without R.E.M. I started it to relay stories from Athens to my friends across the planet, most of whom I met through the Murmurs.com fan site during the weeks leading up to Accelerate. The twitter account? Set that up to follow remroaddog during the tour. REMHQ has linked to my content both here, at WUOG, and Flagpole more times that I can count. I have had so many incredible experiences with this band. They were the soundtrack to my college years, appropriate, no? I got to DJ with Mike, shoot the breeze with Peter, and watch Bill Berry surprise everyone and play drums onstage again. The times I’ve been up to the HQ office have been unforgettable. I’ve gotten so much advice and encouragement from that group. I’m so honored and thankful that I’ve gotten to do so much with a band and its management, especially such a group of good, talented, and amazing people. I’m listening to Collapse Into Now a day after the announcement. It’s oddly comforting. The whole album takes on a new light now, whether by design or not. I keep replaying “It Happened Today” over and over and over. Yes, I’m sad that R.E.M. won’t be releasing any more new material or playing any more shows. But let’s think about all they’ve done. Athens and all its eccentricities are known worldwide because of their loyalty to the town. They introduced their fans to other artists, ranging from Pylon and Love Tractor up through associated acts like the Decemberists. Those of us here in town know that when you see a large anonymous donation to a local charity, you can usually figure out who it was. And that’s the kicker. For all their accomplishments, they stay remarkably humble and low key. That, I think, is the secret. You could always imagine yourself hanging out with a member of R.E.M. in some forgotten bar or record store. If you ever dealt with any of their staff, they practically rolled out the red carpet for you. Fan club? STILL $10. R.E.M. always did it their way. 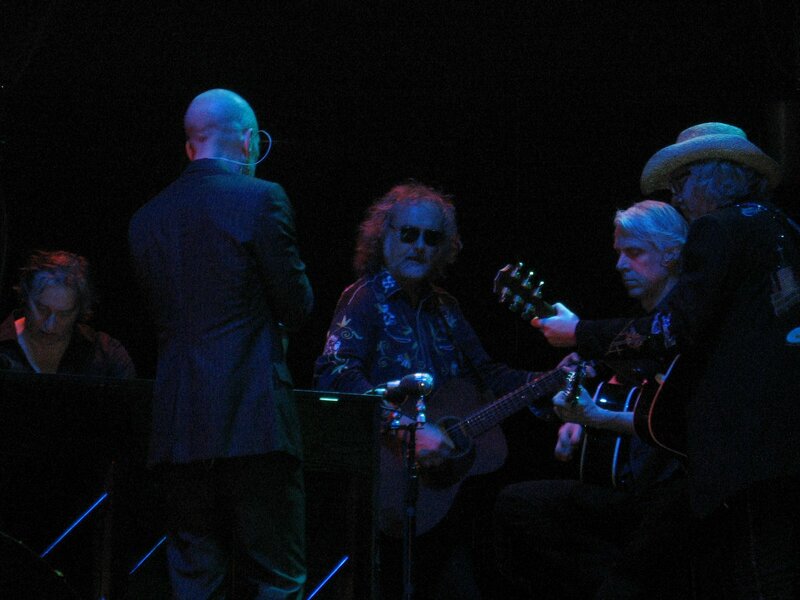 As for us, the fans, friends, and family of R.E.M., at least we can rest easy knowing that we’ve gotten their all. You couldn’t have asked for a better career. The band is not just influential but popular! They outlived all their contemporaries and beat the game. All things must come to an end. R.E.M. didn’t burn out, explode, or outlive their musical life. It’s the right time. So Michael, Peter, Bill, Mike, Scott, Bill R., Bertis, Kevin, Mercer, David, and all the many good people at REMHQ, THANK YOU. From the bottom of my heart and I swear, I’ll Remember Every Moment. I was there in Atlanta in 2008 and I saw them in 2003 in New Orleans. I was the only fan there before the show and the only fan after the show. Scott saw me before the show and as he was leaving I screamed his name and he waved. The bus he was on stopped as it was leaving and he along with Peter, Ken, and Bill stepped off the bus to say hello to me before heading to Birmingham. it was amazing! I feel that a little of myself dies with this announcement, but I knew it was coming oneday. Heck! I was born a month after murmur was released. I agree that Collapse into now takes on a new light after this announcement. Thank you R.E.M. for everything. Your music and albums are bookmarks through out my life. A wonderful post Jordan. A favorite among all of the R.E.M.-end articles I've been reading over the last 24 hours. Let me thank YOU for playing an integral role in experiencing as much as I have in the past couple of years after many years of just loving their music. It started at about 14 years of age for me (35 now) and the love will not end. Thankfully the music will remain to score the rest of my life. It Happened Today! It had to come one day, but I didn’t take it in. It was close on Oct 31, 1997. This time it’s final. I’ve lived and breathed with R.E.M. for 26 years. First show in Berkeley, CA in 1985 and 32 shows later Copenhagen, Denmark in 2008. I’ve been a lucky guy. Not so many people get to see their band this often and not at all get so close to their favorite band. And not so many fans are treated as R.E.M. fans are. The memories are plenty. Staying 3 days at same hotel as R.E.M. for the fan club event in Stockholm, Sweden in 1998. The Norwegian TV show in 1999 and the fan club event in Oslo, Norway 2003. Backstage with the band at Brixton, London. Then several afterparties in California 2004, among them Los Angeles, standing next to Michael when he started singing A-ha’s “Take On Me” to the people around him. The Danish band Mew had just left and he tried to imitate the singers voice: “It’s a Scandinavian thing. I can’t do it”. The Working Rehearsals 2007 and walking the streets of Dublin, a guy called for me. It was Peter and his twins. He wanted to have my opinion on the new songs they played the night before! A year later attended the shows in NYC and Michael ‘s book signing. My wife and I had dinner at Lupa afterwards and we were at the bar when Peter & Scott arrive. They take their time to talk and buy us a drink. And finally last March; Baseball Project at Wuxtry and 40 Watt Club with Kevn & Musical Kings warming up and bringing Bill back behind the drum set. I’m a lucky guy! And down the road I’ve met a great many nice people. The music took me to Athens several times and I fell in love with the city. My R.E.M. collection is huge and it will always be with me. They are not gone. They will not work as R.E.M. anymore. But I can Talk About The Passion. Thanks a million Peter, Mike, Bill & Michael – Bertis, David, Kevin & Dewitt and the staff at REMHQ.